You can probably guess where I gathered the ingredients for this savory winter stir-fry from the post preceding this one. Think of it as a twist on beef stew — but one that takes a fraction of the cooking time. Served with rice and perhaps a simple, stir-fried green on the side, it’s the perfect cold weather meal to really fill up on, and look forward to having again the next day. That was fun. 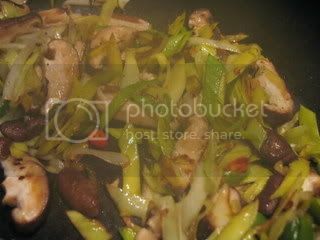 Now, you could substitute other types of mushrooms in this recipe in a pinch, preferably a similarly dense, flavorful one like Porcini. But the true identity of the Shiitake is unmistakably distinct. Just their fragrance alone will cue you in to the intense musky, earthy, almost fishy flavor they produce when touched with a little heat. I’ve never tasted truffles before, and unless a woodland fairy comes along and drops one on my lap, I probably won’t anytime soon. (Since I can’t see myself ever spending $3,000 per pound on an ugly, shriveled elitist trophy of a flavor experience.) So if you’re with me in this respect, fungi doesn’t get much better than Shiitake. Fine by me. 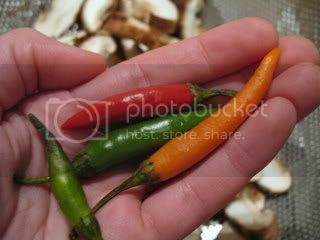 I added a few small, sliced red and green chiles (commonly called Thai chiles), just because I’ve lately been in the habit of adding them to everything. I think they make the world a better place. Marinate the sliced beef in 1 tablespoon of soy sauce, the salt, baking soda and 1 teaspoon of the corn starch. Cover tightly and refrigerate for 1 hour. Five brownie points: This recipe is relatively light, healthy and nutritious. It’s definitely a more agreeable alternative to steak and fries, or hearty beef stew, and satisfies just the same. The corn starch base creates an incredibly luscious, savory sauce that you can smother all over your rice guilt-free. 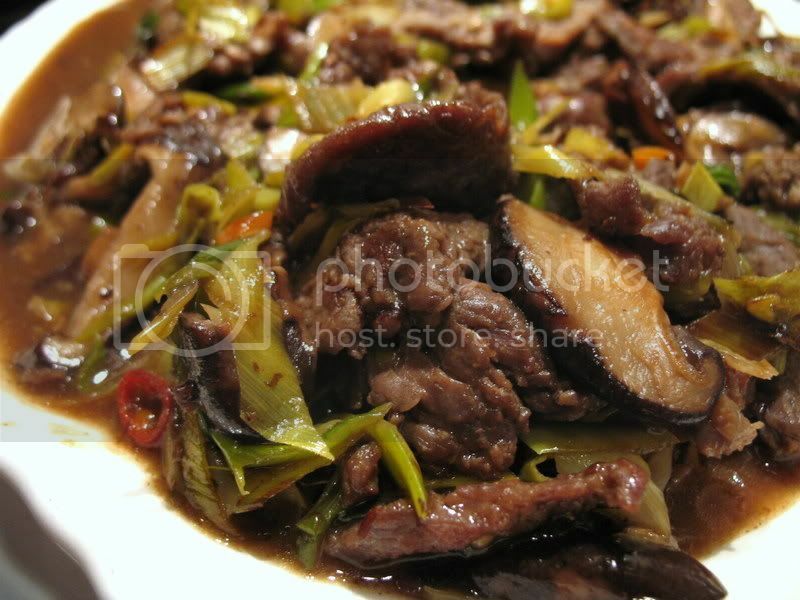 It’s almost all good stuff, save for the preservatives found in most brands of oyster sauce. 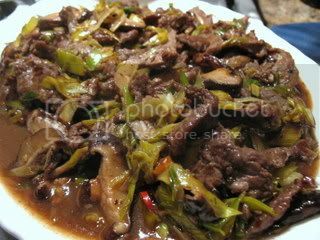 I often waive this or any preservative-heavy sauce altogether in stir-fries, especially when cooking with more assertive vegetables. But with mushrooms and leeks, it’s just kind of yummy. Speaking of which, Shiitake mushrooms boast high protein, many vitamins (including Vitamin D), and purportedly have immunity- and circulation-boosting properties, which is part of why they’ve been ascribed to vitality and long life since ancient times in China. Kind of ironic for something that grows on dead logs, huh? Fresh leeks provide a more modest array of essentials like potassium, beta-carotene and Vitamin C to boot. That looks great! And those mushrooms look just as meaty as the beef. I was surprised by the health factor–but I guess as Shelby says, the mushrooms do look as meaty as the beef! Looks very hearty. I made this last week and it was great. 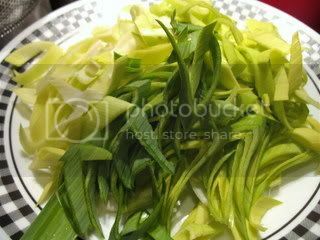 Although I didn’t was the leeks thoroughly enough and that gave me some stomach issues. Live and learn. I’m thinking about substituting chicken to use the leftovers. I made this last night. The photos looked good enough for me to sneakily break my no-meat-buying rule. It turned out really good. Definitely a good hearty winter meal. This was great! Only change I would make next time is to double the mushrooms and add something else green – maybe snow peas! I’ve been taught by some chefs that you shouldn’t throw in garlic and those things until late, ’cause it’s not hard to “bao-xien”, aka making things fragrant in the skillet, but it’s also very easy to burn garlic. also, a lot of Chinese chefs don’t marinate beef in too much salt, they think salt will toughen the meat. instead they use sugar and a dash of soy sauce.